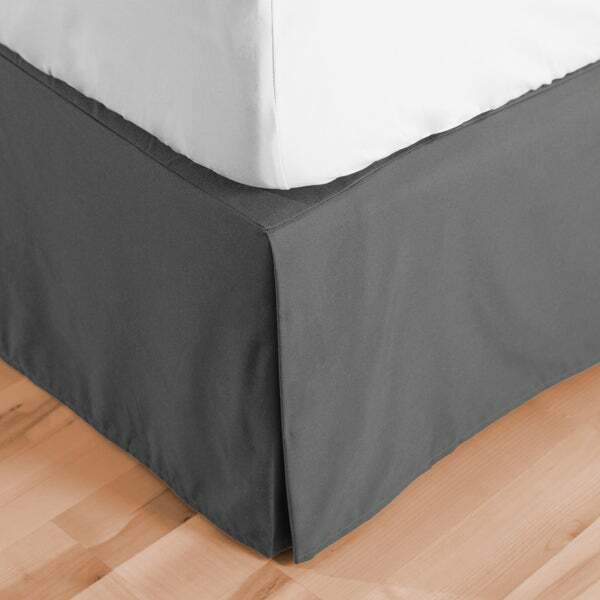 Store items under your bed and cover them with this high quality 15-inch dust ruffle from Porch & Den. The soft microfiber fabric is hypoallergenic and is conveniently machine washable. Easily match this piece to your current sheet set by choosing from the 8 available colors. I like the gray color that I ordered, it is a true gray (no strange green or blue tones) that is a darker gray and close to charcoal. The fabric is very soft and I like that the entire bed skirt is made of the same fabric, so no worries about white showing at the top. It did require ironing but I think all bed skirts must be ironed. Color is just as pictured. It is a bit thin, but hangs well. Be careful to measure your "drop" before ordering. Mine is a tad long, but I tucked it up under the mattress. Would have been perfect if I had ordered a shorter drop. Its fits well and I love the fact that the part that lays on top of the box spring is the same color of the skirt. Ordered two 15" drop queen size in white. Both laundered well with little to no wrinkles. No rips. Good seams and hems. Fit perfectly. This product was exactly what I needed. The size was perfect for my bed. Before I purchased this item I never knew bed skirts had different drop lengths. Now I have the perfect size for my bed. Thanks Overstock!! The computer image was a great representation of the color . The quality , finish and softness of the product exceeded our expectations. The lady of the house has been looking to replace here bedding for over a year that was subtle and elegant for her personal taste yet strong enough to provide a completely updated to for the bedroom. This selection was right on and had it all . I'm very pleased with this bed skirt. The light grey color matches my comforter nicely and the drop is perfect. Thank you! I really appreciate the same material used in the overall construction of this bed skirt. If some shifting does occur, it is all the same color and material that is showing. I also appreciate the sturdiness of the material. When straightening the bed skirt, I was able to gently tug while holding up the mattress. My previous bed skirt would have torn, in fact, it did tear, which is why I ordered this one. Very thin and very cheap looking. I'll admit that I like fabrics like linen and cotten better than the new microfabrics. That said, this bed skirt looks good and goes on easily. It straightened out on its own without ironing. I only deducted one star because it was micorfabric. Yes, I would buy another. Love this bed skirt! Fits perfectly and fabric is really soft. Arrived promptly and as pictured. Fits my daybed perfectly, just wish it was designed for the daybed. I love it and never thought that I could find anouther, Most of the time I have to take and cut the corners and use liquid stich just to get by. These fit like a glove. Didn’t come out the way I expected but it could be me not knowing exactly how to put it on. Skirt fit my bed just right and the color was nice! "Is the sand a light brown color?" It’s a roasted marshmallow / golden ish caramel color. "It is all one piece isn't it? I've seen some that you have to "pin" to the box spring"
This one is all one piece. No pinning to the box spring. "What are the dimensions for the California King size?" "My twin beds have a 16" drop from floor to top of box spring. Will this bedskirt work ok for that drop?" "What is the name of the color in photo Dark Grey or Grey?" I have a foot board ...Is there a slit in the shirt to fit on either side of the pole on the foot board? Bought these bed skirts to go with gray and white chevron patterned guilt for king bed with swing-away bed frame for twin mattresses. "DOES THIS HAVE SPLIT CORNERS?" The corners open, in pleated manner.